Headaches and migraines are two of the most common pains that people suffer form and although a headache may be mild or throbbing and last a few hours a migraine is a more serious condition where the pain may even last for days. 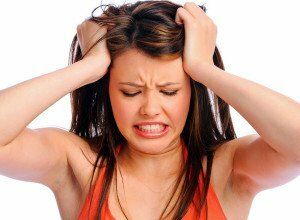 In most cases common headache is caused by excessive stress, tension and emotional changes. But migraine is a more complex situation where the blood vessels of the brain enlarge to release chemicals from the nerve fibers that cause inflammation and hence the severe pain. Hormonal Change– That’s the reason two-third of women experience extreme headaches during the time or just before the onset of periods. Migraines become more common after the onset of puberty and gradually decrease after menopause. Eating Habits– Yet another major trigger of migraine is the food we eat. Most common triggers of migraine are alcohol, tobacco, caffeine and fermented foods. 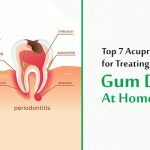 Other Causes– Stress, tension, work pressure, sleeping disorders and changed atmospheric pressure may also lead to severe headache and nausea. 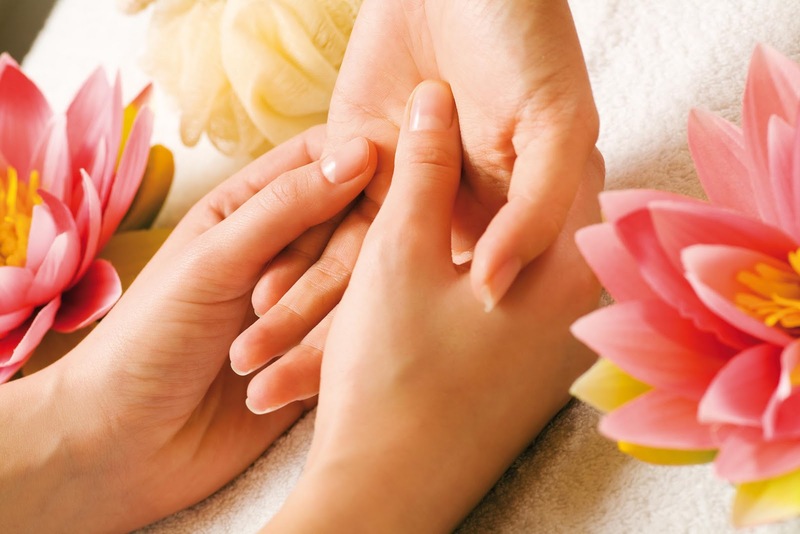 The benefits and helpful aspects of Reflexology are numerous and it can be used effectively for treating pains and aliments. 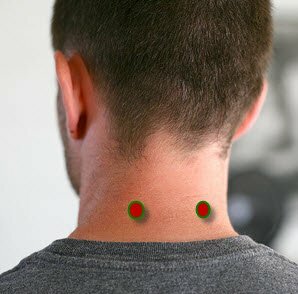 A majority of the pains and irritations above the neck are caused by excess muscle tension and vascular imbalance and therefore can be healed effectively through acupressure and reflexology because the acupressure points in this area are easily accessible and can be triggered with very little pressure. While over the counter medicines can provide instant relief but in most cases it is a temporary one, but reflexology not only treats the problems externally but heals the ailment from within so that you can get over it completely. All the points on the face and forehead are yang pints that are full of energy that generate from the head and face and flow downwards. 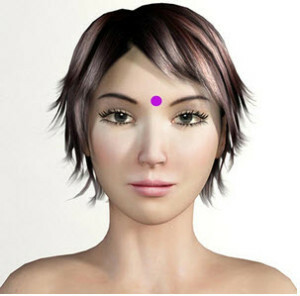 Third Eye Point– This point is located just between the two eyebrows where the bridge of the nose meets the forehead. Applying pressure on this region helps in improving concentration, reliving eye strain, headaches, and ulcer pains. Apply pressure for 1 minute and then move to the next point. Bright Light– This point is situated in the inner corner of the eyes just below the eyebrows. 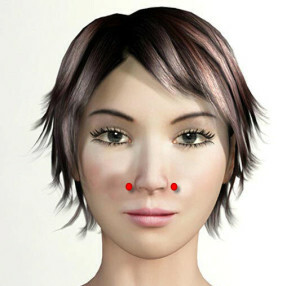 Applying pressure at these points works excellent in relieving sinus headaches and allergy symptoms. In addition, it also helps in improving vision. Apply pressure for 1 minute on both sides. 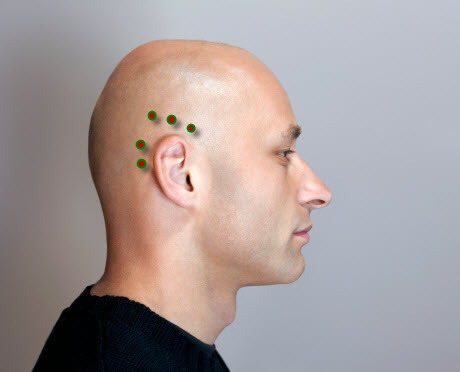 In the temple region there are a chain of points that curl around the ear starting from the top of the ear and are situated just one finger width from the ear. All these points have to be worked simultaneously for effective results. Here we have numbered the pints as 1, 2, 3, 4 and 5 so that the points can be located in the image with ease. 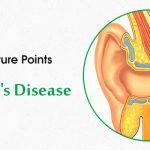 Point 1 is located near the tip of the ear and the rest of the points curl around the ear. Applying pressure on these points helps in relieving temporal headaches on the sides of the head and migraines. Welcome Fragrance-This points are located both sides of the nostril. Applying pressure on these points helps in opening sinuses and reducing tension headaches. Wind Pool– This point is located at the back of the head, halfway between your ear and spine; between the two muscles that come together. Applying pressure at Wind Pool helps in unblocking nasal congestion, relieving pain in eyes, ears, throat, headaches and migraines. 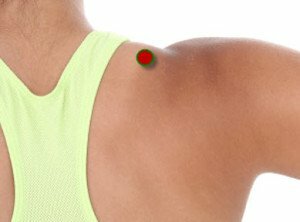 Shoulder Well– This point is located at the edge of the Shoulder halfway between the point of your shoulder and the base of your neck. Applying pressure on this point helps in reducing stiffness of neck and shoulders and relieving neck pain. 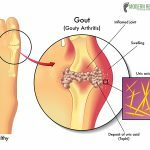 It also helps in relieving other ailments like asthma and spasms. Heaven’s Pillar– This point is located 2 fingers below the base of the skull on the rope like muscles present on both sides of the spine. Applying pressure on this point helps in relieving aches at the back of the head, neck pains, eyestrain, stress, insomnia and stiff neck. Stimulating the Heaven’s Pillar also helps in cough relief. Union Valley– This point is located in the web between you thumb and index finger. Applying pressure on this point helps in relieving back pain, frontal headaches, tooth ache and releasing tension from neck and head. 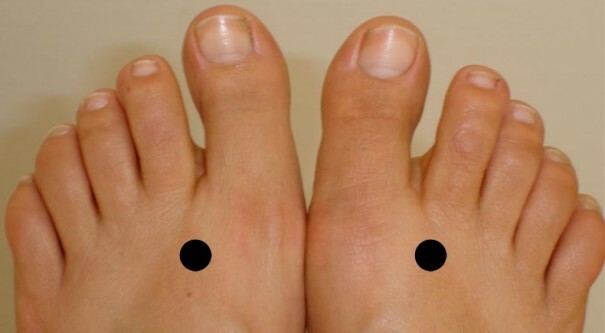 Moving Between– This point is located in the valley between the big and the second toe. Applying pressure on this point helps in relieving headaches, tiredness of eye, arthritis and foot cramps. Headaches may be a common problem but that does not mean it should be neglected. But instead of resorting to medicine and pills, know the reflexology zones and give reflexology and acupressure a chance to see the difference. Experiment with the pressure points you have chosen because specific pressure points work more effectively for specific type of headaches and some points might show strong results while others might take more time. Therefore try out each of the pressure points to know which points work best for you. im currently attending dialasys 3x per week for over a yr. at this point, I’m about to receive a kidney transplant. 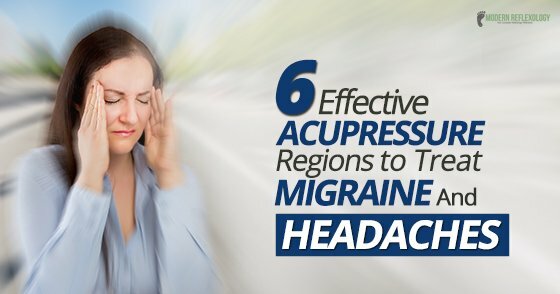 Lately, migraines have been a problem with ea treatment. They rush me via ambulance to local hosp and give me a migraine cocktail which puts me to sleep then sends me home. I don’t feel this is the solution. I feel it’s the chemical in the dialyzer but no one will listen to me and it’s killing me. I have a kidney donor and if I can survive a little longer I will survive. Between the sickness for yrs from diabetes and now kidney disease, it’s a slow death. Being strong daily is a tough task but for my husband and daughter, I do my best and hang on. This article was helpful and thank you. 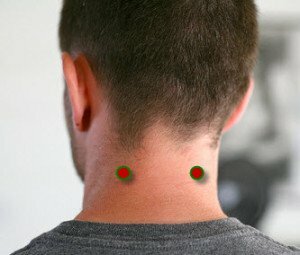 Are there pressure points to relieve headaches in out finger tips? I find that when I type, my headache pain lessens. Am I imagining this, because it is a pain distraction, or is it possible that there are pain relief points in out finger tips? Hi, I had headaches for many years and tried everything form acupuncture to massage and didn’t’ want to take so much Ibuprofen. I then tried a massage point on my back, near my armpit, with a tennis ball. You know you have the right spot when you can feel something in your forearm and palm of your hand (thumb area). When ever I feel a headache coming on, I will massage the area either against a wall or lying down on a bed, with my body weight rolling the ball and keeping the ball in place with pressure on the spot. I know this must be a headache pressure point, even though it is not mentioned here, because you can feel it being linked to all the areas, acupuncture, thia and Indian massage target. I just found the area on the back gives instant relief. Hopes this helps anyone with constant never ending headaches. Thank you, this took my migraine from a 8/10 to a 3, so I could get some sleep. Thank you! I was experiencing the worst headache of my life & tried these techniques. Immediate relief! I was having migraine pain from 2 hours…pressing these points of the head cured it almost 70%. We are so glad it helped you. Thanks for sharing this. Many of us are not comfortable taking harsh medicines just for minor headache. Headaches can get very uncomfortable weather it’s minor or major. This will help people who would like to take control of their bodies and find cute within. Absolutely true this is a holistic approach to health and wellness. 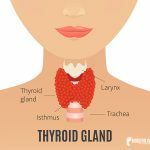 ..my daughter age 16yrs is facing migrane issue…here several points are mentioned to cure..
Start with one and if it does not work you can try the other points. Thanks for the informative stuff. The points you mentioned are really effective and works like a miracle. Oh! Thank you so much for appreciating our work. 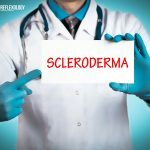 Hi Swetha, do follow this article and you will soon get good results.